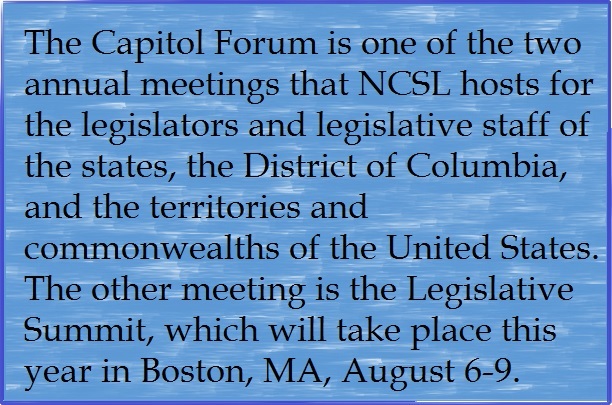 The NCSL standing committees are important to the organization’s assistance to legislatures on state issues and its representation of state interests in Washington, D.C.
Much of the work during the Capitol Forum consists of training incoming legislative and staff officers for their duties to their respective NCSL standing committees. NCSL standing committee officers have a variety of responsibilities, including planning the committees’ agenda for the year, suggesting program topics and speakers, reviewing proposed policy directives (long-standing statements on issues that must be reviewed every four years) and resolutions (statements targeted to specific pieces of legislation or other federal mandates that expire every legislative summit, but must have a basis in a policy directive), presiding over programs, and participating in meetings. Any state legislator can submit policy directives or resolutions for a committee’s consideration. Legislative staff does not vote on any of the policy directives or resolutions in order to maintain our nonpartisan responsibilities. As a newly appointed staff co-chair for the Budgets and Revenues Committee, I attended the meeting to learn what it means to be a staff co-chair and I also sat in on many discussions regarding budgeting, taxation, and revenue issues, particularly related to the plans of incoming congressional legislative leaders and the executive branch administration. From the Budgets and Revenues perspective, the most relevant topic to Colorado was a presentation on state implications of federal tax reform. While trying to understand what’s happening in Washington, D.C., is a bit like reading the tea leaves, the presenters, Helen Hecht, chief counsel of the Multistate Tax Commission (of which Colorado is a member state), and Joe Crosby, of Multistate Associates (a D.C. lobbying firm), both have considerable insight and expertise in this area. The central message of the discussion was that states need to pay attention to whatever tax reform is passed by Congress. This is because most states, including Colorado, piggy-back their income tax laws to the federal tax code, so federal tax reform could have a wide-ranging effect on Colorado’s revenue projections. There are many options being discussed as part of a federal tax reform package including lowering the tax rates; broadening the base by eliminating many tax deductions and credits and capping interest deductions; dealing with the repatriation of foreign earnings; and moving from a “worldwide” system of taxation to a “territorial” system. In the current political climate this list of examples ranges from easiest to hardest. Speaker Paul Ryan’s (R – Wis.) tax reform plan is detailed here. However, Senate Finance Chairman Orrin Hatch (R-Utah) has told business leaders that the Senate will work on its own tax reform plan rather than waiting for the House plan to pass and that it will “almost surely end up looking different than what passes in the House.” President Trump set forth his own tax reform plan during the campaign that is detailed here. Broadening the federal tax base by eliminating federal tax deductions and credits would probably mean an increase in Colorado’s income tax revenues. That in turn could necessitate a review of Colorado’s tax laws to see whether Colorado should adopt all the federal base-broadening changes (e.g., state tax credits based on federal tax credits) or lower state rates. These policy decisions are made more difficult when considered in conjunction with TABOR’s effects. Tax experts also mention that it is not clear how capping the interest expense deductions will work or what the general effect will be on how a business is financed. States may not be directly affected if there is an effort to repatriate foreign earnings, but studies of the 2004 repatriation “holiday” show that more may need to be done to ensure that repatriated money is actually used to grow the domestic economy. Finally, the effort to move from a “worldwide” system of taxation to a “territorial” system is very complicated and best left to the experts. Suffice it to say, there would probably need to be some state income tax law revisions to consider if such a substantial tax reform were to pass. Because of the wide-ranging effect of the federal tax reform proposals on Colorado, and on other states, NCSL is keeping a keen eye on what happens on the hill and will continue to share that knowledge with state legislators and state legislative staff in a timely manner in order to assist our efforts in balancing and passing the state budget.